A slow draining kitchen sink, water puddles in shower, and an overflowed toilet are all signs of clogged drains. Clogged drains not only look nasty and cause inconvenience; they can also pose a number of health risks due to bacterial growth both inside the pipes and in the standing water. Clogged drains are one of the most common household plumbing issues. While you may not be able to completely avoid the problem, you can significantly reduce its occurrence by being careful of what goes down your house drains. There are many things that go down our house drains. While some of them are beyond our control, there are a few things that we can certainly prevent from entering the drainage system of our houses. Fat is one of the major culprits of clogged kitchen sinks. As opposed to what many of us believe, oil, grease, or any type of fat does not flow down the pipes like a dishwashing liquid. Instead, water causes it to cool down, solidify, and form a layer inside the pipes. Since most of us do not regularly clean our household drains, the layer continues to buildup and create clogs. Remember that fat clogs are some of the most stubborn drain clogs and cannot be removed with DIY tips – you will need to call a professional plumber to get rid of it. Food waste includes leftover food, gravies, pieces of egg shells, sauces, rice, and seeds, rinds, peels, and pieces of vegetables and fruits. No matter how little the amount is, any type of food waste should never go down your kitchen sink, even if you have a garbage disposal. Food particles can get stuck in the elbow joint of the pipe and obstruct the water flow. Despite the fact that we know it is wrong, many of us have been guilty of throwing foreign items down the toilet drain. Feminine hygiene products, dental floss, wipes, and cotton swabs are among the major causes of clogged drains. 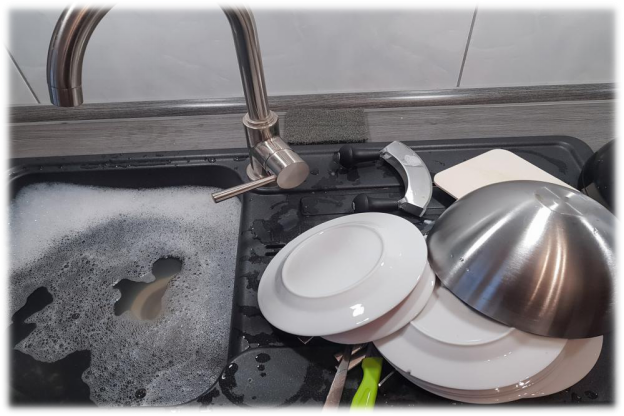 Always remove food particles and fat from the plates before putting them in the kitchen sink. When it comes to bathroom drains, always remember that nothing but human waste, water and toilet paper should go down the pipes. If you think that you can get rid of clogs by trying out some DIYs or commercial drain cleaners, let us tell you that you can end up damaging your pipes. Most commercial cleaners contain harsh chemicals that can cause significant damage to household plumbing systems. Similarly, since you are not an expert, you are likely to cause damage the pipes by using the wrong techniques or equipment. Different types of clogs need to be treated in different ways, so it is always a good idea to call a professional drain cleaner whenever you are faced with the problem. For drain cleaning in Gilbert, AZ, call 480-535-0728 to get professional services any time. Gilbert Plumbing is available 24/7 to deal with plumbing emergencies because we know they can wreak havoc in your house.